In Ajijic, the entire month of October is devoted to the Virgin of the Rosary, whose statue resides the rest of the year in the small chapel on the Plaza. A small pre-procession will occur on Sept. 30 from the Guadalupe Church to the San Andres church in the late afternoon. Special Masses, which include the saying of the Rosary, will be held every evening throughout the month. Afterwards, there are usually a few more cohetes to propel the prayers of the people to God. 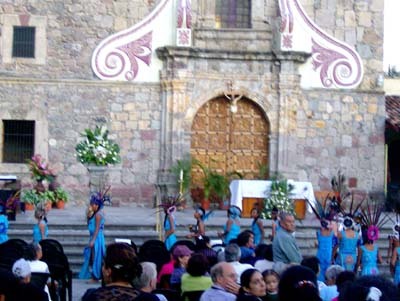 On weekends during October, you might hear early morning sky-rockets and/or bandas or mariachis as they proceed from various points in town to the church for the early morning Mass. The whole point of having cohetes, bandas, and processions including singers in the pre-dawn hours is to wake up the people for the morning Mass, not that everyone goes every day. While some northerners are put off by all the early morning "noise" it is important to remember that these are long-held and deep traditions emanating from the time before there were alarm clocks, all the way back to the pre-hispanic times. Most of the good people of the village are up at that hour anyway, as half of the kids go to the early shift at their schools. These are not holidays. Life goes on, people go to work and school as usual, and so the gringos can kindly curtail their complaining. Also, the past three years. 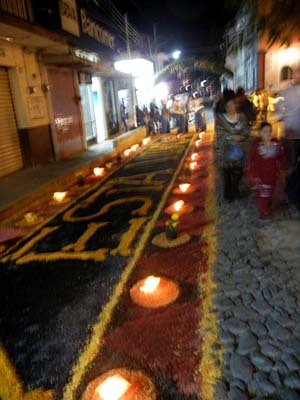 since 2016, there is the Fiesta de San Miguel in the San Miguel barrio of Ajijic, above Tempesqui. Their saint is carried in a procession from a hillside cave and then proceeds though Ajijic.This tradition has made a revival after 200 years of its absence. 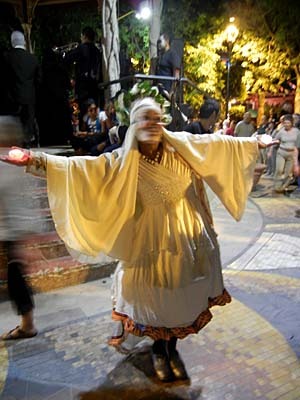 October 31 is the last day of the month-long celebration, so there will be an large evening fiesta beginning with a procession including floats, Danzantes, bandas, and the carrying of La Virgen, herself, through the town. It starts around 5pm behind the church on Calle Galeana, and then heads east on Guadalupe Victoria, down Calle Aldama, west down Constitucion and Ocampo to Seis Esquinas (6 Corners) and back to the San Andres church to a welcome of the exuberant and rousing pealing of bells, brass bandas playing as several groups of Danzantes Aztecas with their drummers, heralded by the blowing of conch shells, and La Virgen, enter the church Atrium just before the twilight outdoor Mass as the sun sets - a truly dynamic and moving spectacular of jubilant and cacophonous sound healing. After the Mass, people will gather in the Plaza when La Virgen will ceremoniously be carried back to her home in the Chapel, where she will be serenaded by Mariachis, and honored by more Danzantes outside. Later, there will be a Banda playing for dancing and enjoyment, and around 10:30 or 11pm, there will be a Castillo lit up in front of the Chapel on the Plaza - a preview of the San Andres fiesta in November which will have such events for 9 days straight, an awesome amount of fun. 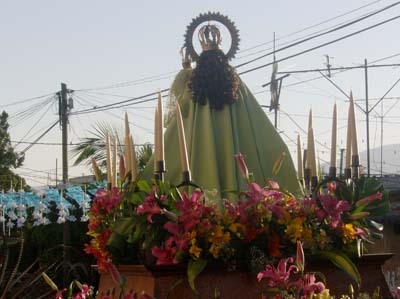 In 2017 the Virgin of Zapopan arrived in Ajijic on October 29. She remained until October 31 when Virgin of Rosario returned to her chapel. Please note that Halloween is not celebrated in Mexico and that the above events have absolutely nothing to do with Halloween, although you might see small children (only) in costumes or masks, owing to the trickle down of US commercialism to Mexico. The past few years, Ajijic has participated in a Fundraiser. This year the fundraiser will be for a much needed Cruz Roja ambulance -Thriller, a dance that is sycronized throughout the world so everyone is dancing to Michael Jackson's hit 'Thriller'. This year the event is October 27th on the Ajijic Malecon at 4pm then immediately after at seis esquinas, with a parade back to the plaza. 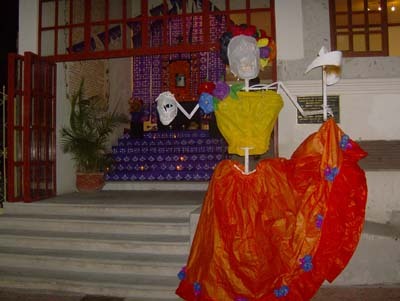 Heads Up for Dia de los Muertos, Day of the Dead, which occurs every November 1 and 2, the 2nd being the larger day. November 1 commemorates the Angelitos - the little angels, the children and babies who have died and gone to heaven's door to . In the cemetery, you'll see altars built for small children with milk, cookies, baby bottles, and stuffed toys - touching enough to make you cry. Dia de los Muertos, has none of the spooky, evil, or macabre connotations of Halloween up north. In fact, it is a loving and heartfelt tribute to the dear departed loved ones and ancestors of the people. All the skulls and skeletons you'll be seeing are simply a very realistic depiction of the current state of their loved ones. After centuries of a long and bloody history, Mexicans are not afraid to look Death squarely in the face. Traditionally celebrated in cemeteries throughout Mexico, families go together to visit the graves of their ancestors, bringing their favorite food, drinks and music in hopes that the spirits of their ancestors will come back to visit. It is a very happy/sad and moving experience as long-departed loved ones can be remembered with a light-hearted touch, while grieving continues for the newly departed. Many habitantes will sit up all night at the cemetery for this ancient ritual. The delegacion will have a guided tour through the Ajijic Pantheon (cemetery). Meets at the Ajijic Panteon (public cemetery-west Ajijic Ocampo Entrance) 3:00 or 5:00 p.m. Cost 200 pesos which goes to Christmas dispensas (food boxes) for police families. Look at the Ajijic News Calendar for more events. Chapala has had a unique public 3-block-party with most of the residents of Calle 5 de Mayo building large altars outside their homes, celebrating there instead of the cemetery. This street is centrally located and easy to find on a map. 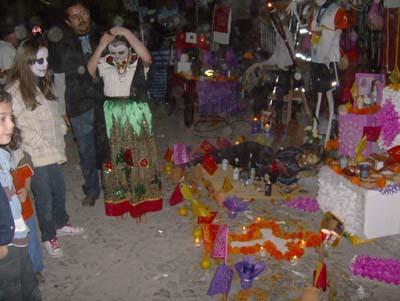 Dia de los Muertos events generally commence at dark. Begins at 6pm. The time, energy, creativity, love, and devotion that the people here put into these fabulous fiestas never fails to amaze and awe me. Please come out and enjoy the Real Mexico. The foreign presence is always so sparse at all these very rich, traditional, and fun events. The Fiesta Season continues through November with Revolution Day and the always wonderful San Andres Fiesta. More later on these very enjoyable days. Stay tuned!